An African archbishop who scandalised the Catholic Church with a 'Moonie' marriage before returning to the fold looks set to shock the Vatican again. Emmanuel Milingo has held a surprise news conference calling on the Catholic Church to allow priests to marry. He has spent the last four years living quietly outside Rome following his return to the church. 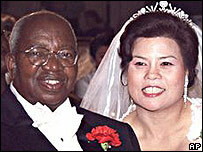 In 2001, the Zambian married in a mass wedding conducted by Reverend Sun Myung Moon's Unification Church. Archbishop Milingo went missing from his Italian retreat last month and resurfaced in Washington on Wednesday, Reuters news agency reports. He told reporters it was time for the Church to "reconcile with married priests". And he urged priests punished for marrying to "come out of their Catholic prisons and be reinstated, taking once more their pastoral responsibility among the married priests". The former archbishop of Lusaka stunned the Vatican when he disappeared in 2001 and turned up in New York to marry 43-year-old South Korean acupuncturist Maria Sung in a mass wedding organised by the Moon church. He renounced his marriage four months later saying he wanted to return to the church, which never recognised the marriage and had threatened to excommunicate him. The late Pope John Paul II personally intervened and, after a year of rehabilitation in South America, Archbishop Milingo moved to the convent near Rome. Archbishop Milingo told the Associated Press in a telephone interview that he did not want to leave the church, but to change it. He said priests who had fallen in love "have been driven to become almost mental cases". It is not clear if he has been reunited with his wife. The Vatican is reported to be "shocked" by his latest outburst and is considering disciplinary measures.